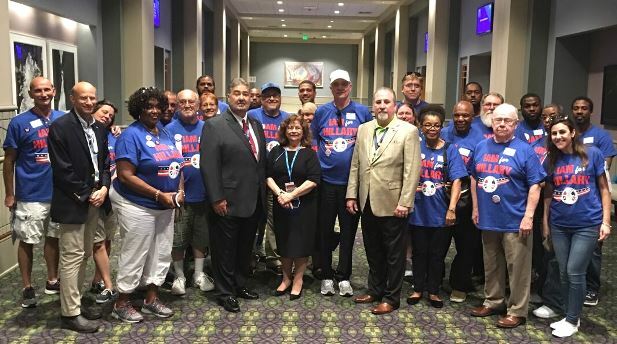 IAM International President Bob Martinez speaks at a rally for retirees at the Democratic National Convention in Philadelphia. “Hillary Clinton is a proven fighter for the middle class and the unions that built it,” said Martinez. For Local 1776 member Sandra Niedermair, this year’s presidential election is a choice between preserving unions and making them a relic of history. Hillary Clinton is her candidate, and she’s not shy about it. “She’s for women, she’s for our children, she’s for unions,” said Niedermair, a stock clerk at Philadelphia International Airport. Niedermair is one of more than 30 IAM members and retirees in Philadelphia this week for the Democratic National Convention. Their mission: Elect Hillary Clinton as the next president of the United States, and stop Donald Trump. For people here, many of them union members, Social Security and Medicare are key issues. Clinton, an honorary IAM member, has proven she’ll stand up to any attempt to cut either, and wants to expand Social Security for caregivers of sick relatives. She also wants to finally allow Medicare to negotiate down prescription drug costs. The newly-minted GOP platform calls for looking at cuts to retirement programs, or raising the retirement age. 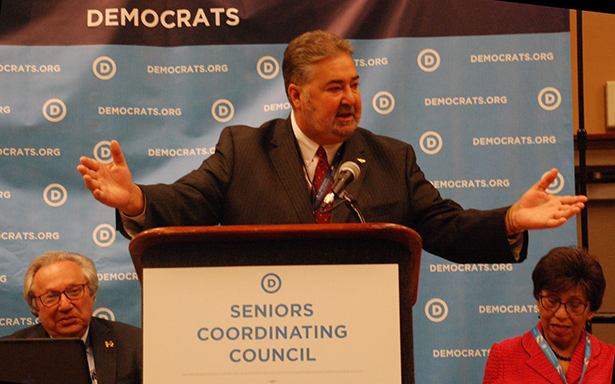 The Democratic National Committee’s Seniors Council, co-chaired by former IAM Community Services Director Maria Cordone, is mobilizing seniors to win in November. IAM Retirees Director Edward Manhart led the Machinists Union’s delegation to the council’s meeting. Niedermair, a 22-year IAM member, sums up her choice this November simply. More than 30 IAM members and retirees joined Machinists Union leadership for a rally to protect Social Security and Medicare.